Ideal for jumbo-size projects. Now with adjustable heat up to 400 F (205 C). 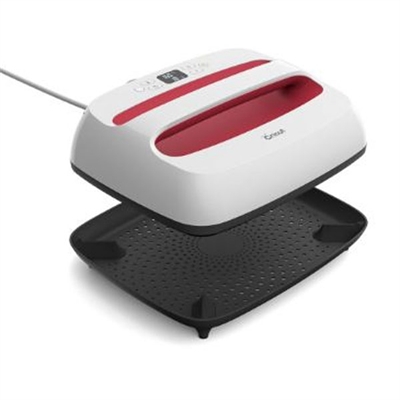 Cricut EasyPress 2 gives you professional iron-on results in 60 seconds or less. Combining the speed of a heat press and the convenience of iron, EasyPress gives you fast and foolproof results that really stick, even after repeated washes. Eliminate guesswork with rigorously tested time and temperature settings for every project, apply gentle pressure, and when the beep sounds, you're done! Helpful safety features include an insulated resting base and auto-shutoff feature. EasyPress is lightweight, portable, easy to store, and compatible with major brands of heat-transfer material. And of course, it's a perfect complement to Cricut cutting machines. Raspberry. The Easypress is well worth the money! Made making shirts SO much easier than trying to use a regular iron! Buy it!